New York, NY – October 1, 2018 – The Breast Cancer Research Foundation (BCRF) today announced a record-breaking $63 million commitment to fund breast cancer research for 2018-2019. The grants will support the work of 300 scientists at leading academic and medical institutions in 14 countries. BCRF-funded research spans the entire spectrum of cancer – from the most basic biology of a cancer cell to developing innovative new treatments and improving quality of life. Each year, BCRF significantly invests in research for metastatic breast cancer (MBC). This year, more than one-third of BCRF‘s grants are focused on MBC. Studies include understanding the biology of why and how cancer cells spread, the development of new treatments for advanced disease, and correlative studies to discover biomarkers that can predict which breast cancers are more likely to spread. In addition, BCRF has committed $31 million to date for the Evelyn H. Lauder Founder’s Fund, a multi-year international program dedicated to research in metastatic breast cancer (MBC). The flagship programs of the Founder’s Fund Initiative are the AURORA programs in the US and Europe. These programs represent the first large-scale global efforts to unravel the biology of MBC. This year, BCRF will launch a multi-year, dedicated prevention research initiative. The goal of the prevention initiative is to identify research projects with high potential to reduce the incidence of invasive breast cancer. This initiative is aimed at creating a future in which women can benefit from the wide range of innovative strategies that can propel prevention as well as treatment, with advances in individual risk assessment; surveillance and risk reduction; and, using the tools of precision medicine, artificial intelligence, epidemiology and immunology to reduce the incidence of breast cancer with all possible speed. BCRF is committing more than $12 million to early detection and prevention research. These projects include studies that are shedding new light on the underlying relationship between obesity and breast cancer risk; identifying environmental factors that may influence risk; designing novel lifestyle intervention strategies; discovering biomarkers in blood and tissue that can identify persons at risk; understanding the early influence of diet and weight on future breast cancer risk; among others. Research in tumor biology represents the bulk of BCRF research grants, with more than $34 million awarded this year. That’s because nearly all breast cancer research requires an understanding of the basic biology of cancer. Without discoveries in the laboratory, new treatments for patients, biomarkers that can help identify the right drug for each patient, cancer risk genes and prevention strategies would all remain a mystery. BCRF’s continued investment in basic research is moving the needle forward in all areas of breast cancer research in new and innovative ways. BCRF will invest $30 million into developing new treatments for breast cancer, with an emphasis on metastatic breast cancer. In addition to its annual program, this year BCRF will expand investments in developing novel treatments through two special programs: studying the use of a prostate cancer drug in breast cancer and through increased investments in immuno-oncology. Family history, genetics and race/ethnicity all contribute to an individual’s risk of breast cancer. BCRF is investing over $5.7 million in research in inherited susceptibility. Studies include understanding how mutations in the breast cancer genes BRCA1 and BRCA2 modify risk; identifying new breast cancer susceptibility genes and predicting the risk they have on developing breast cancer, and identifying prevention and screening strategies for individuals at high risk. BCRF is committed to addressing the diverse factors affecting disparities in breast cancer outcomes. 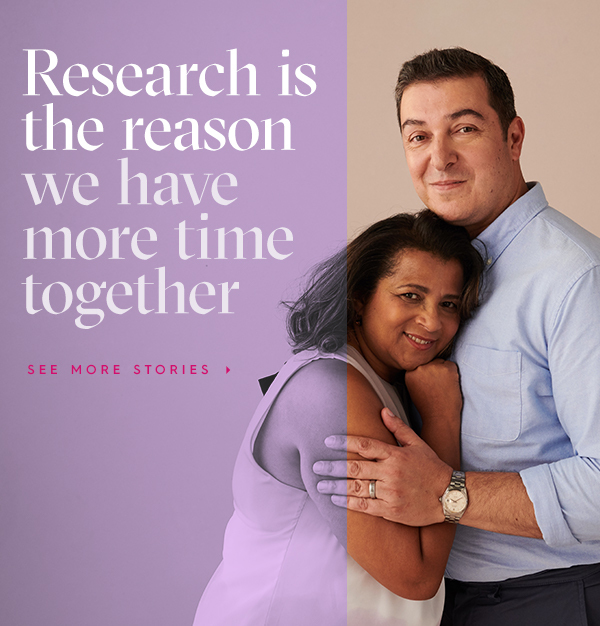 BCRF has committed more than $2.5 million in studies to understand the differences in genetic and biological risk factors across populations; improve access to genetic testing in high-risk minority groups; as well as access to screening and diagnosis, quality care and affordable medications to underserved populations and patients in low resources settings. As cancer’s toll grows around the world, it is on pace to replace infectious diseases as the single greatest threat to global health and development. In fact, the World Health Organization predicts that more people will die from cancer by 2030 than from AIDS, malaria and tuberculosis combined. BCRF’s global presence is reflected in its support of 32 international researchers in 14 countries totaling more than $5 million in grants outside the US. Learn more about these projects by tuning in to “Investigating Breast Cancer,” the official podcast of BCRF. Available on iTunes and bcrf.org/podcasts.